Grandma baked the best chocolate cookies one has ever had. She also let me wash these chocolaty treats down with seven ounce ‘Seven-Up’. Soda was forbidden at our house, so this was a special refreshment. Grandma was a strong independent woman whose generosity was huge. She ran the local church kitchen with authority. My memories of my grandfather are few but his deep gravely voice was fondly remembered. He passed and the house my grandma lived in suddenly became too large for her alone. She decided it was time to move to the ‘Matilda Brown Rest Home’. This was no ordinary ‘Rest Home’. It was beautiful, exclusive, and close to our house. I was allowed to ride my bicycle by my self to the Matilda Brown palace. It was barely over a mile but it seemed like a long journey. My grandma seemed happy in her new home. There were lots of activities to experience. They always held events to draw us children to participate. When we visited, grandma would shower us with gifts. Clothes, candy, a couple of quarters which in those days bought a handful of chocolate bars and a special gift would be given to us. This special gift was a big bag filled with one ounce jelly packets. At first receiving a bag of jelly packets was a little disappointing to our young minds. 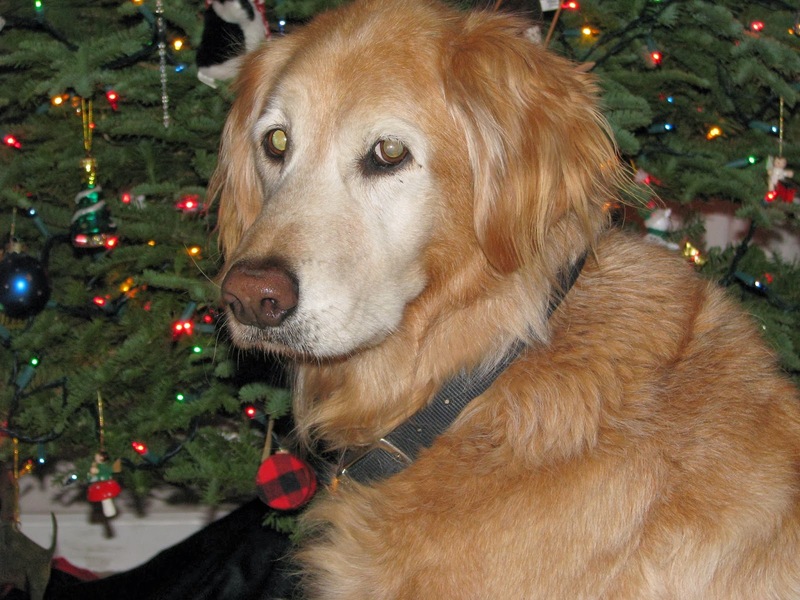 A stern glance from my mother signaled us to be grateful and thank Grandma. We found out that every morning our Grandma would take several packets of jelly from the breakfast table. She would save them and gift them to us when we visited. I grew to like and appreciate this peculiar gift. 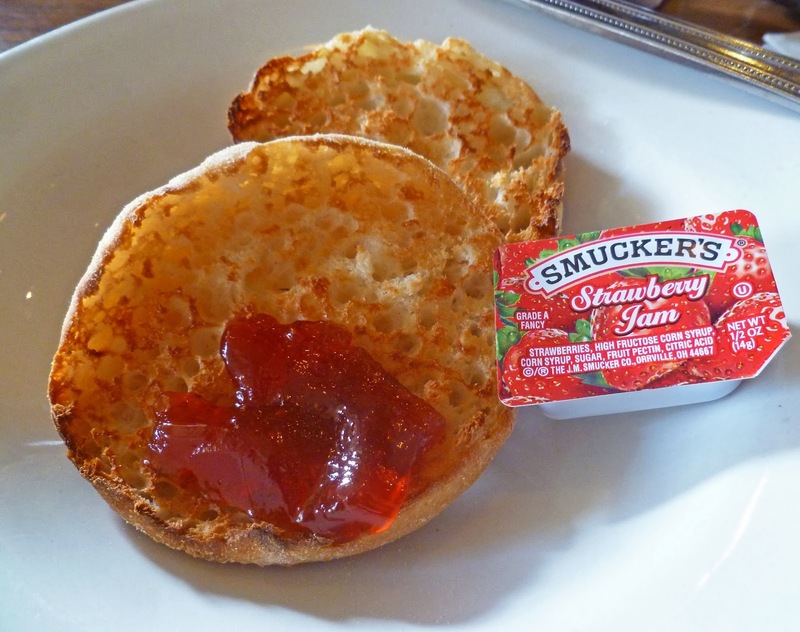 I had a special fondness for the strawberry flavored jelly. When we ran low it was time to pay a visit to Grandma. Why did Grandma save these packets? She surely could afford to buy any jelly or jam she desired. I later came to the realization it was my Grandma’s way of showing her love. She grew up during the depression and later experienced war rationing. Jelly was a treat and you did not want to waste this extravagant condiment. Her nature was to take care of others and to share was her demonstration of love. When ever I go to a restaurant and have a strawberry jelly packet I fondly remember this time. Grandma I love you. Living in the Bay Area we are lucky to have access to hundreds of Mexican restaurants. 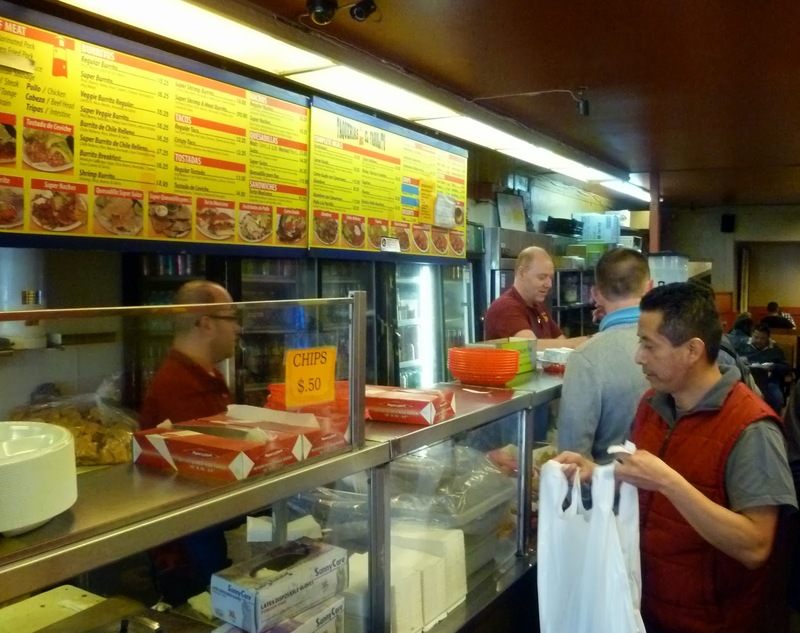 We enjoy going to the ‘City’ (San Francisco) to taquerias that we have never tried before. Periodically, newspapers and magazines publish a ‘Best of’ list and ‘Taqueria El Farolito’ always makes the grade. We fueled the racing Honda and sped across the bridge. 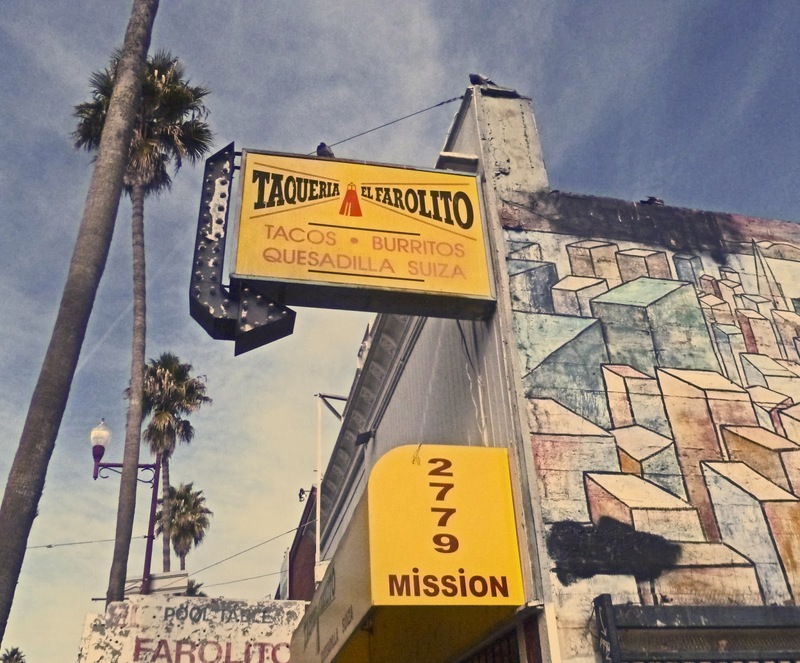 It was time visit the ‘Mission District’ and experience some authentic, urban, taqueria grub. The Mission district is a colorful, ethnically diverse, crowded, gritty neighborhood. Parking is a scarce commodity in this area, so when we found a spot on the same block we considered ourselves very lucky. I had planned ahead with a pocketful of quarters. The meter would only allow us 30 minutes to dine. The clock began to tick. We arrived to a short line inside a well worn dining establishment. You placed your order at the counter, helped yourself to the salsa bar and take a seat until your number is called. The prices were more than reasonable. 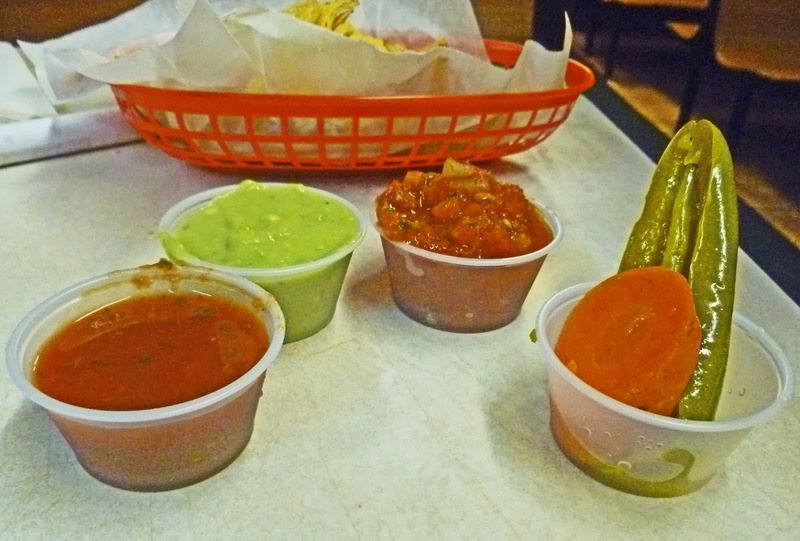 The four salsas were fresh and vibrant. This was a great start to our meal. When a restaurant takes the time to make flavorful and fresh accompaniments, it is a good indicator of the food to come. Steak burritos were our choice today. (Chile Verde was not on the menu). I do not like this word but it seems appropriate; quintessential burritos filled our plate today. Perfectly tender beef with the kiss of the grill flavor was the star. So many taquerias skimp on the carne but not today. Fresh avocado, sour cream, pinto beans (your choice), and rice all rolled up in a soft flour tortillas made for a very filling lunch. The clock was ticking. Should I run out and feed the meter? We finished our lunch and returned to the Racing Honda. 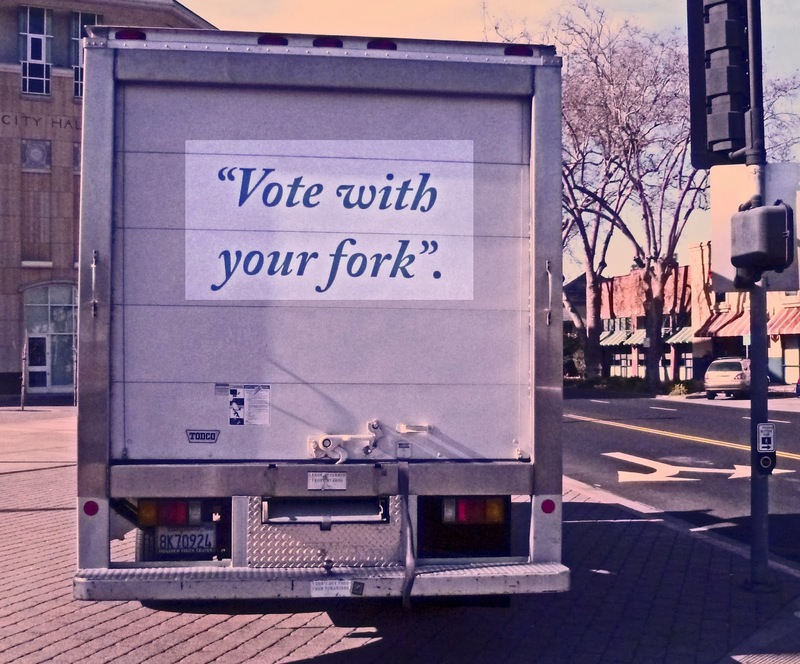 The meter was flashing a bright red expired sign. Luckily the meter maid was probably enjoying a burrito herself. 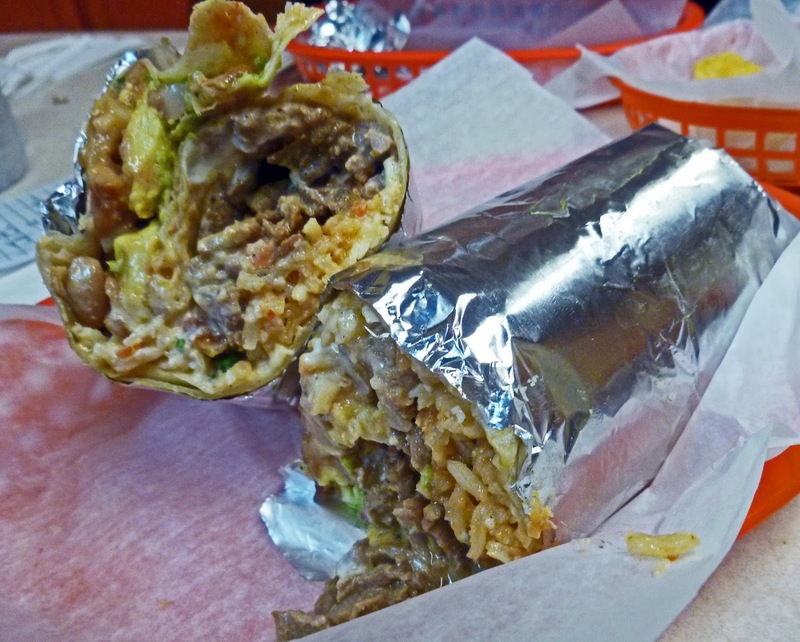 Taqueria El Farolito is a great place to grab a burrito. Would you like to limbo at Caribbean beach party and experience jerk style barbeque? Well shimmy under the limbo stick and take a look. The latest review of 'Secret Aardvarks Drunken Jerk' is available. Are you looking for a special rub for that bbq meal? Do you want to make some of the best bacon ever? Have a look at our latest review of 'Ribs Within' on 'Peppers & More"
We cooked some ribs last night to begin the weekend of football and barbeque. Grills and smokers across the nation will be working overtime for the festivities this Sunday. These ribs were a warm-up to the game-day food frenzy.. They were smoked on the 14.5 WSM. 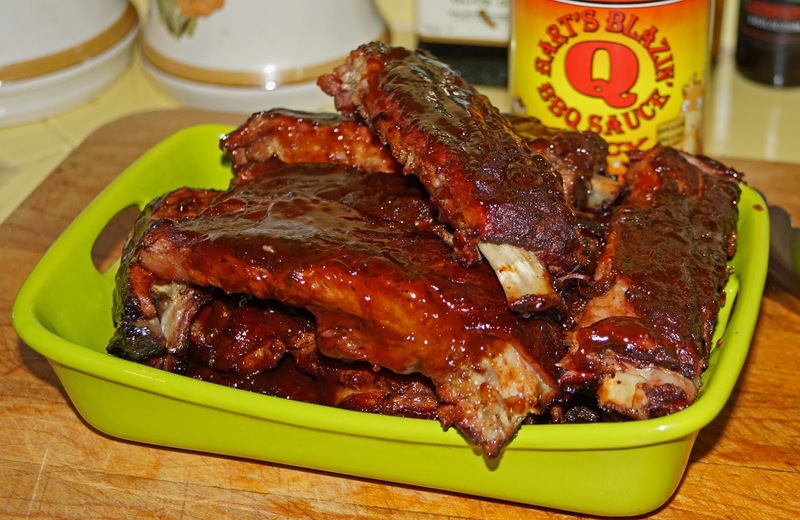 The sauce was from our friends at 'Bart's Blazin Q' . Have fun!! Vegetables are not just a prop to add color to a meat picture, or are they? Believe it or not this Mad Meat Genius loves certain produce when they are in season and at their peak. The preparation and cooking method is all important to enjoy these non meat items. 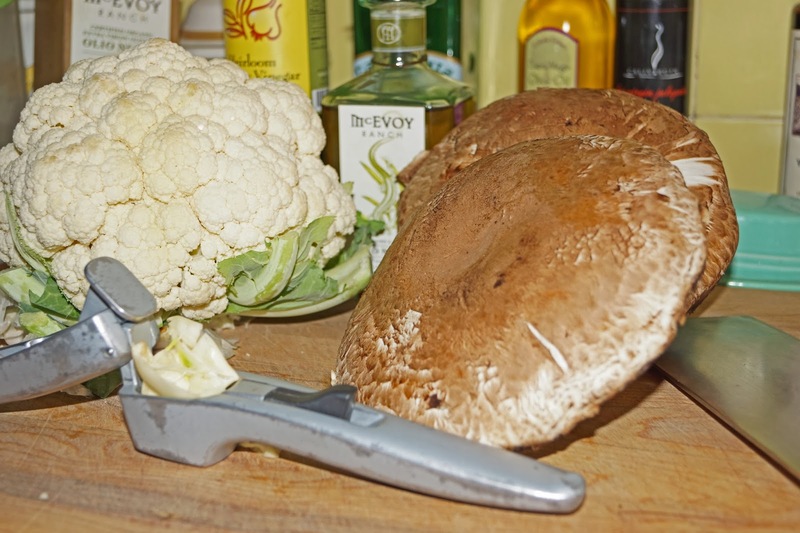 Cauliflower steaks are on the plate today. We picked up a very nice head of cauliflower at our local farmers market. High in fiber, low in calories (approximately 210 calories/head), roasting on the grill will be our cooking method. A marinade of McEvoys's extra virgin 'Olio Nuovo olive oil, aged balsamic vinegar, crushed garlic and salt & pepper will anoint these thick florets. A sharp knife sliced this head into one inch steaks. The marinade was poured over the steaks in a Ziploc bag and put into the ice cave for several hours. A mesquite charcoal fire was ignited. 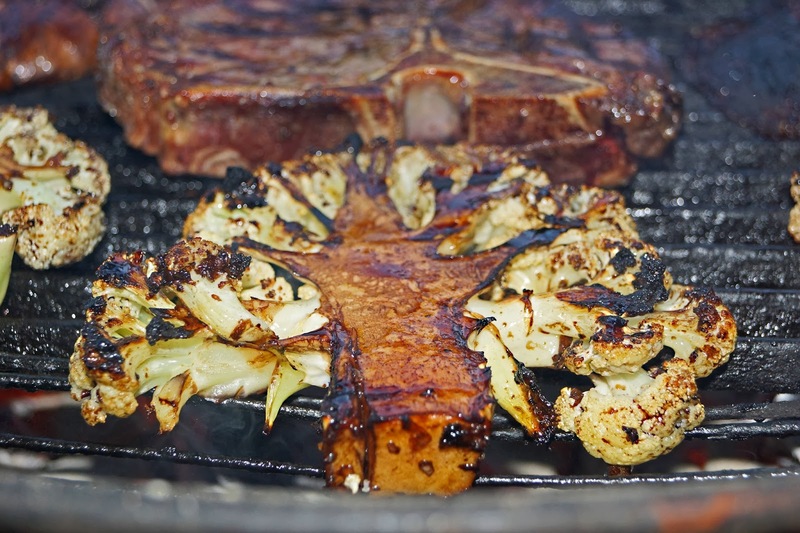 Once the fire had subsided and the coals were smokin hot, we oiled our cast iron cooking grate. 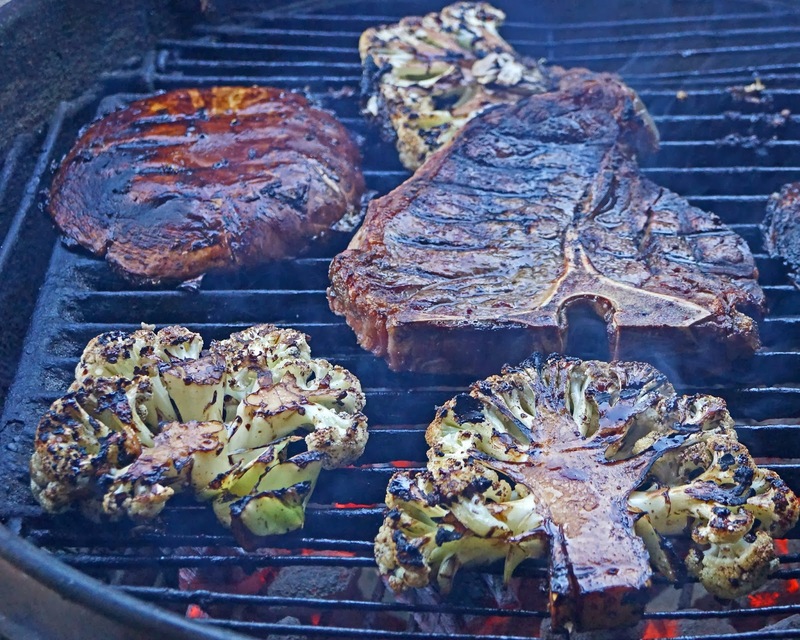 We loaded up the grill with our cauliflower steaks and several other food items. We cooked the steaks for around four minutes per side. We wanted to get some char and some carmelization on our steaks. It was time to eat. Roasting cauliflower steaks brings out the natural sweetness of this vegetable. The garlic, oil and vinegar added a dimension of flavor that was outstanding. The texture was tender but still crisp with crunchy caramelized edges that were created by the hot fire and sugars of the vinegar. This is a great way to enjoy cauliflower. 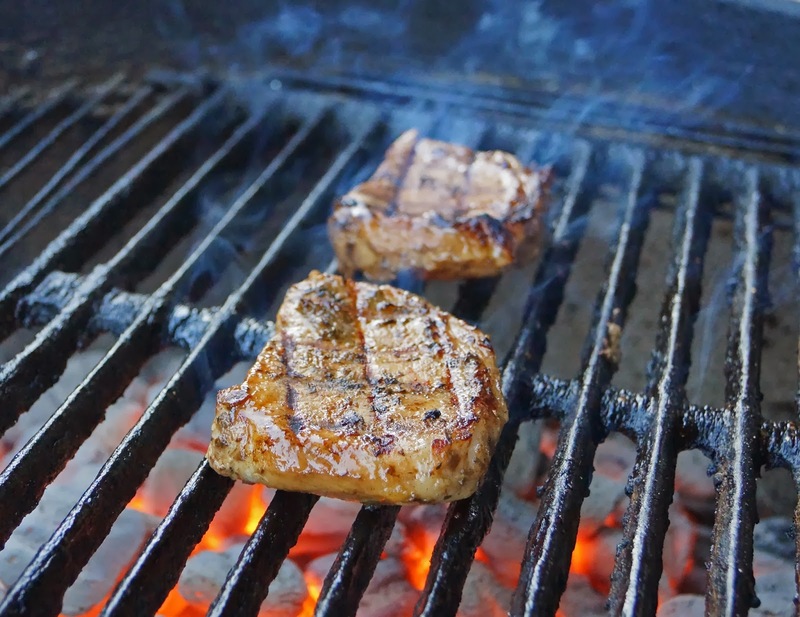 This marinade and method will work with many other vegetables. Go to a farmers market, (Friday Richmond Farmers Market yours truly is the manager) and purchase some cauliflower or whatever is in season and have some fun. Lucy our lucky dog wants to be on a hot sauce label. 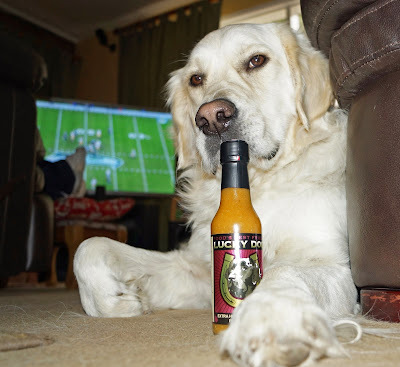 Our latest review of Lucky Dog hot sauces in up on Peppers & More. This sauce is fueled by ghost peppers, habaneros, serranos and finishes with applewood smoked sea salt. It is not scorching hot but is blended for flavor. Take a look. 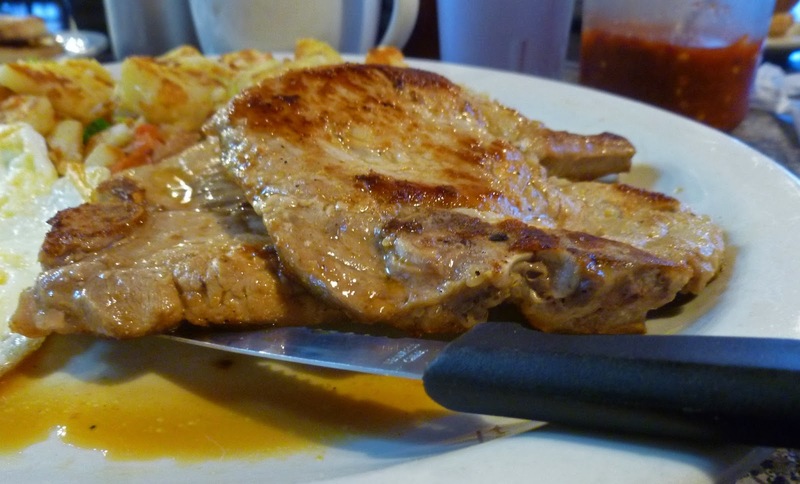 The search for the ‘Killer’ pork chops brings us to Anna’a Place in El Cerrito California. This café serves an eclectic mix of Korean, American diner style food. It was recommended by several friends and it was time to give it a try. 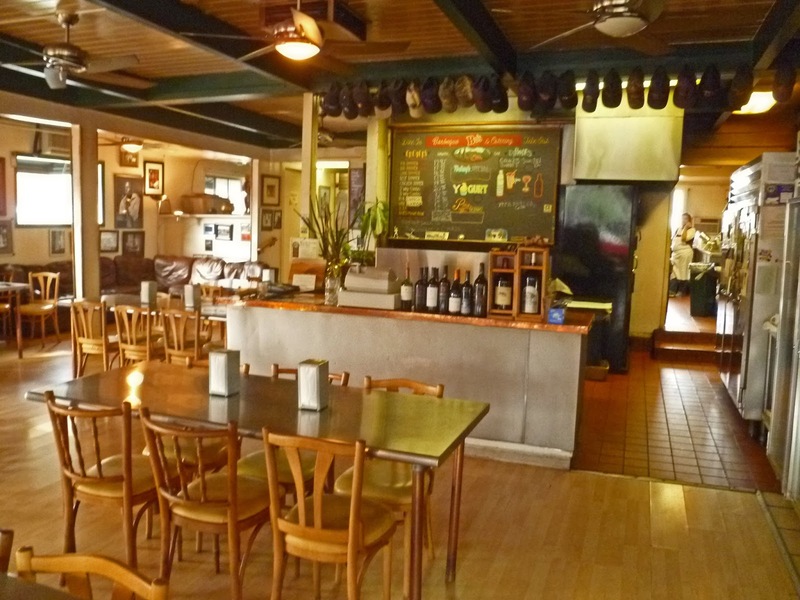 It is located in a small strip mall surrounded by senior housing with in walking distance of the Bart station. We did not take Bart because Ms. Goofy said something about blowing the carbon out of the exhaust of the Racing Honda. A quick ‘white knuckle’ jaunt down the track (freeway) and we were there. The menu is huge with standard American breakfast and lunch fair. There are a lot of Korean and fusion style dishes too. We were there for the pork chops, so ‘Be Bim Bap’ will have to wait for another day. I did ask for hot sauce, The waitress brought us a sauce which she called a Chinese hot sauce. We were some of the first customers of the morning and our service was prompt and fast. The dishes arrived almost as fast as our speedy arrival. The dishes looked large and scrumptious. The pork chops were juicy, tender and satisfying. 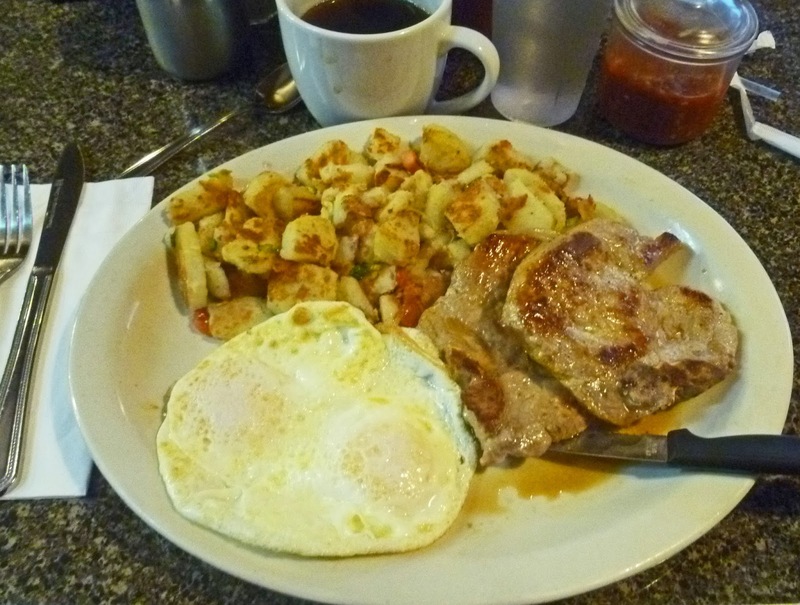 Home fries & eggs that accompanied were smothered in the zesty Chinese hot sauce. The hot sauce was home made with a fresh pepper bite. We were happy and full. Anna’s Place serves a very decent breakfast. The journey for pork chops will continue but we will return to Anna’s Place to try the ‘Be Bim Bap’ (I still am not sure what this is but is sounds fun). The GPS of the 'Racing Honda' is set to 'Bo's Barbecue and Catering' in Lafayette California today. We have heard nothing but praise and accolades of this barbeque dining establishment. This restaurant uses pedigree meats from Niman Ranch and Fulton Valley Farms. We teamed up with our friends Butch & Karla. They are certified judges and barbeque competitors. 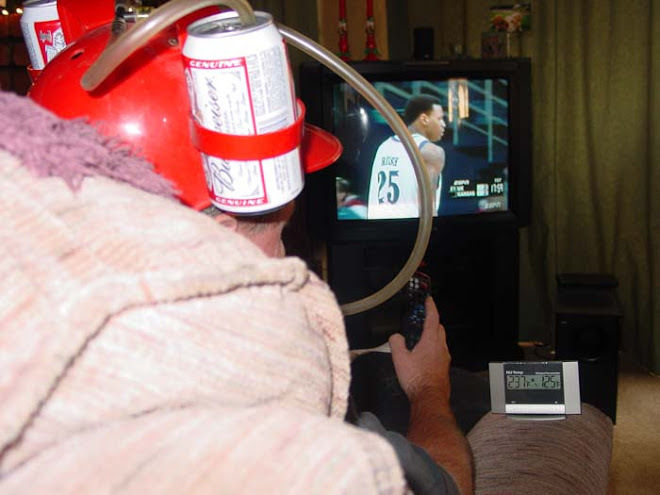 We have high expectations today. Ms. Goofy pulls the emergency brake and we four wheel slide into the parking lot. We exit the Racing Honda and the first thing we see is Bo. He is loading up a handcart with oak wood. He greets us with a smile and a hearty welcome. He is dressed in shorts and sandals. We immediately bond and begin to swap stories. Bo has a colorful story telling way of talking. He made us feel like an old friend. 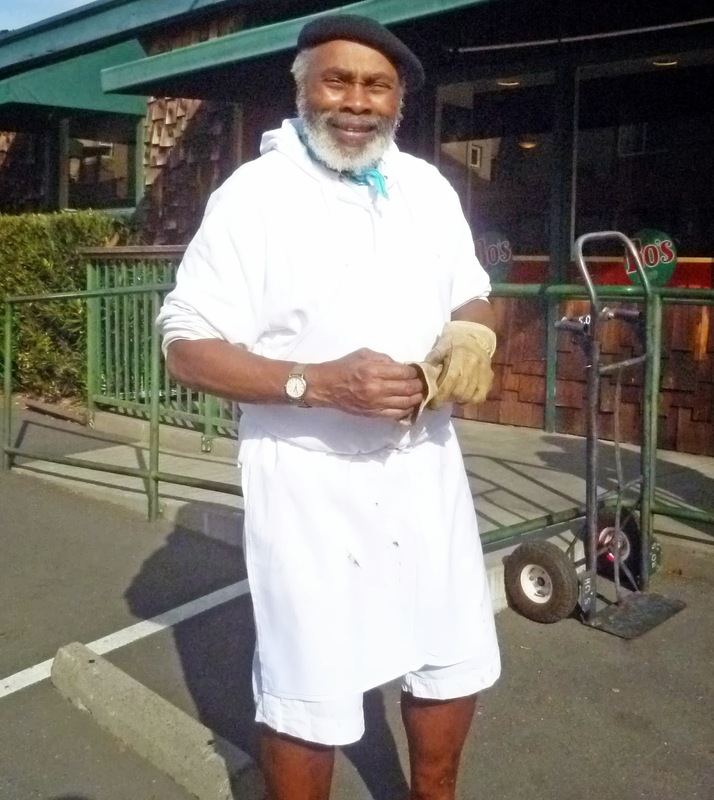 He tells us that he uses oak wood to start his smoking process and finishes with apple wood. The brisket will smoke for 24 hours. He is very proud of his brisket. He uses an analogy that we are in a plane and Tri-Tip is the seats in the back next to the toilet and brisket is in first class section. 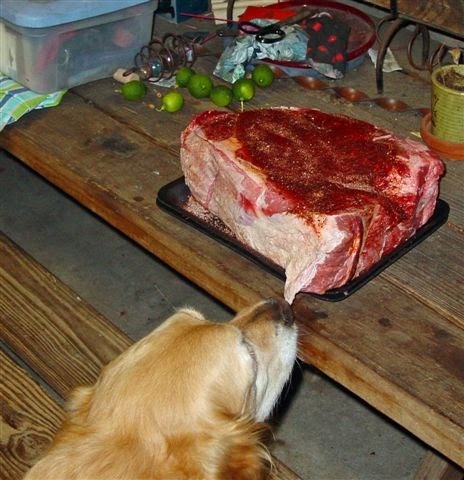 (baby) Bo has whetted our appetite for brisket. Inside Bo's restaurant is a very cozy and warm environment. There is a corner that is flanked by large oversize leather couches. The walls are peppered with pictures and art. 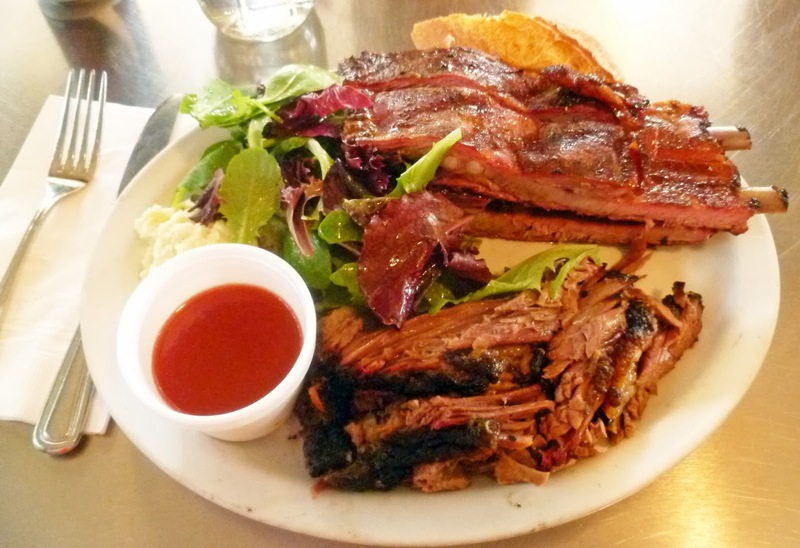 It is the noon hour and only us and several other diners are present Brisket, Ribs and Sausage would be sampled today. Our plates arrive and they are huge and look very delicious.Each plate comes with sides of a nice green salad, potato salad and a piece of french bread. The sauce is on the side in a ramekin. It is sweet vinegar based with tabasco pepper flavor. It is sweet, tangy and fresh. The heat is very slight. 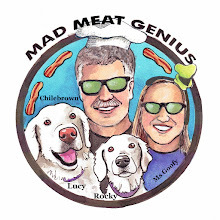 I have been avoiding and saving the meat critique because we so wanted to love our meal. Here we go. The brisket was stringy and a little chewy. It had the texture and taste of pot roast. The pork ribs were huge with the rib tips attached. These ribs were some of the greasiest ribs ever. My hands were covered with pork grease and a pool of fat remained on the plate. The flavor and seasoning was just not there. The sausage had flavor but was so dry it was like eating sawdust. Oh my, did we just come on an off day? I would like to leave you today with an old quote from our good friend Reverend Biggles. "You can go to a barbeque restaurant and have the best meal of your life and return three hours later and have the worst meal ever". We hope that is the case. 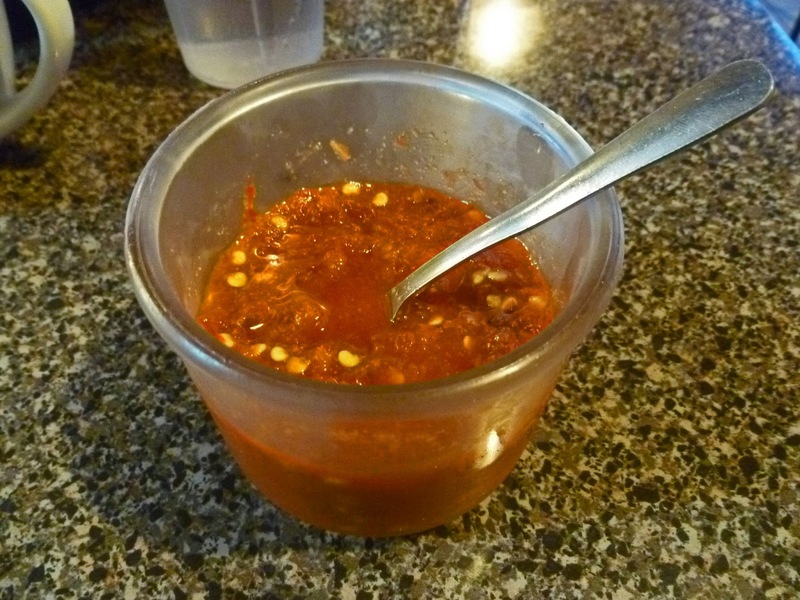 Our latest hot sauce review is a tease in a sense. 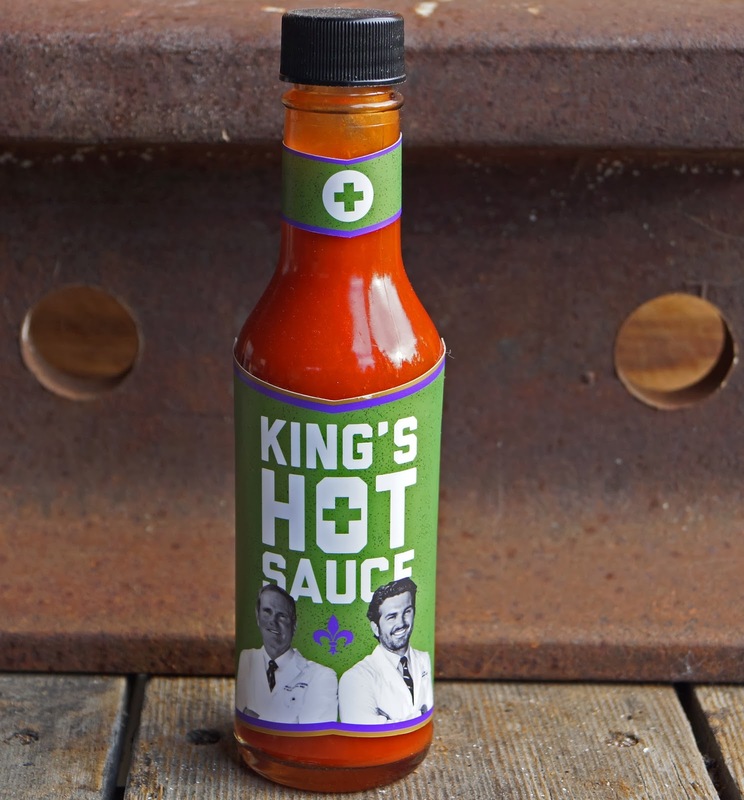 King's Hot Sauce is only in the planning stages and is not for available for sale.We really do not have much information except an interesting back story. We did enjoy it and you can read the review by the link below. Cooking bacon is a personnel experience that can be soothing, comforting and darn right pleasurable. We all have our preferences about how bacon should be prepared. 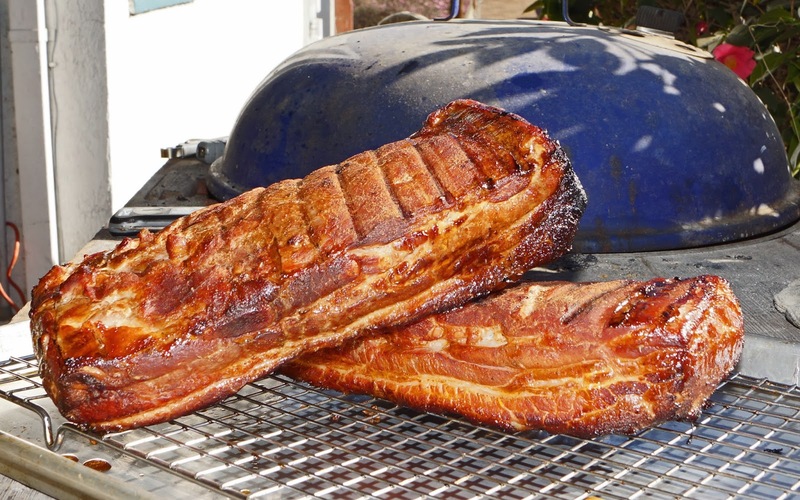 Fried, baked, broiled, braised and even grilled on the barbeque are different methods to render bacon love. Each method has it merits I like to fry my rashers in our trusty old black iron pan. If only our cast iron pan could talk and share the bacon experiences we have shared. This Christmas my sister (The President of Cookies) gifted us a bacon press. This all important tool will enhance our bacon cooking experience. This particular bacon tool has some heft and girth. It fits perfectly snug in our 'Number 8' Lodge pan. It has ridges on the bottom to allow bacon grease to freely flow, We had to season this tool because it is made of cast iron. It was washed, dried, oiled and gently heated. This created an almost non-stick coating to the cooking ridges. It worked like a charm. 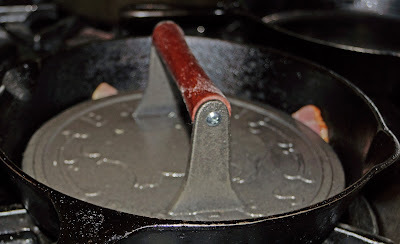 It pressed the bacon flat to the pan to ensure even cooking. The results wers crisp and evenly cooked yummy bacon strips . 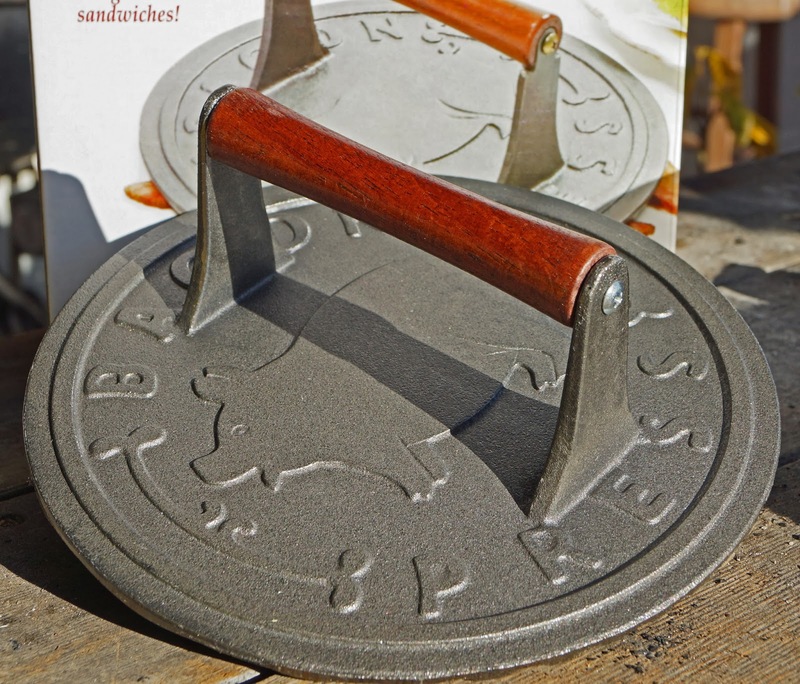 This heavy tool will also work on sandwiches like a panini press. Our bacon press is a welcome addition to the Chilebrown kitchen. Santa Claus drove a van and wore a brown suit this year. 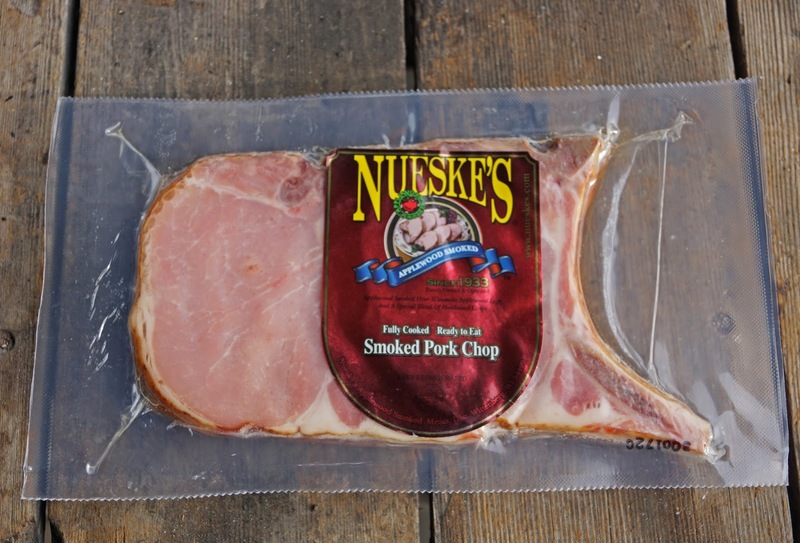 Ms. Goofy knows I have a weakness for all pork products from Nueske's Meats from Wisconsin. They may make some of the best bacon in the nation. My Christmas stocking was filled with apple-wood smoked bacon and pork chops It was time to enjoy this Christmas bounty. We opened the vacuum packed package of chops and were greeted with a pleasant sweet apple-wood aroma. 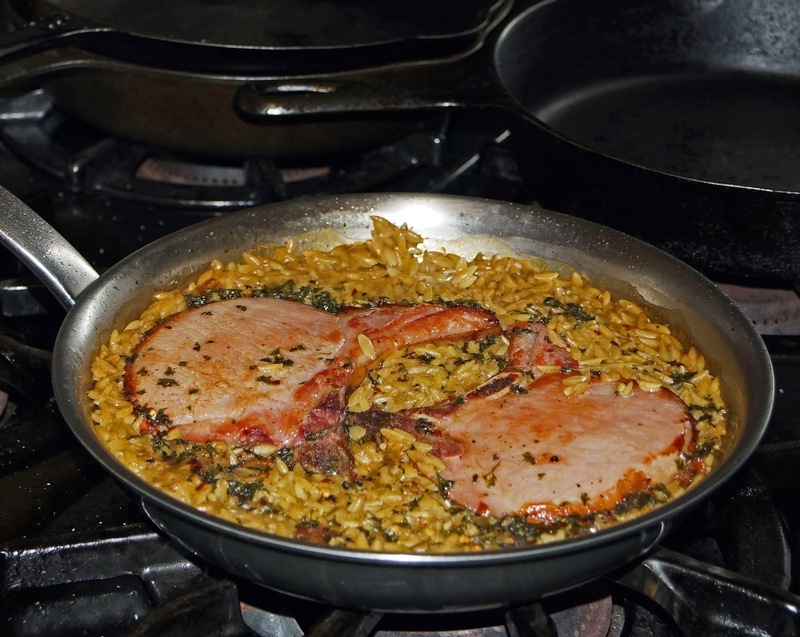 A quick searing in a skillet and orzo, spices and stock was added. A trip to the oven to finish and we were ready to feast. These chops were fantastic. The sweet cure transformed this meat to a ham like texture. The smoke was slight and intoxicating. 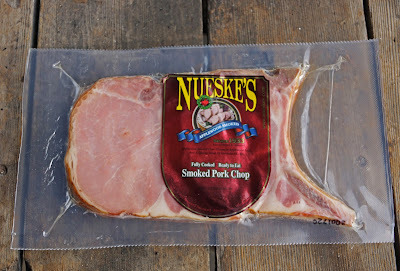 Nueske's pork products do not disappoint. Ms. Goofy know's what I like. Yummynoodles!!!! !